Despite this weekend being pretty busy, I managed to fit a bit of sewing in on Sunday. Here’s a little peek of what I’m working on at the moment. 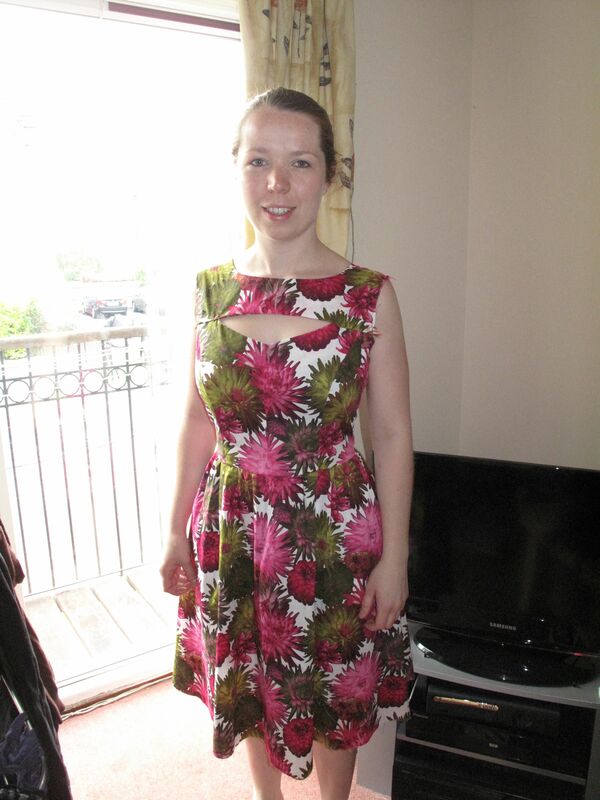 Simplicity 1803 – this is the dress I chose for my dressmaking course, and the first item of clothing I’ve attempted. I am really pleased with how everything is turning out – I’m learning lots of new skills, and so far (touch wood!) everything has worked! This weekend I did the gathering on the skirt, and attached it to the bodice, and again, I’m delighted with the result! Definite success on that one! Unfortunately my second sewing project did not have quite successful progress. I was inspired by this version of Simplicity 2415 by Lisette of What would Nancy Drew wear? I love the fit with the darts in the back. I had some fabric in mind, but decided to give it a go first with some plain black fabric I had, in case it went wrong. Now, with 1803, I ended up making a couple of sizes smaller than my measurements suggested, due to the 4 inches of ease included in the pattern. It was quite easy to work out what size to make from the actual garment measurements, as it’s meant to be quite a close fitting bodice. However, the peasant blouse doesn’t need to fit quite so closely, so it was more guesswork as to which size would work best. I measured up as a size 14-16, and decided to make the 12, so that it hopefully wouldn’t be too loose. Oh how wrong I was. It started well – I sewed the elastic casing for the sleeves and threaded the elastic through, and they looked very ‘sleeve-like’. So far, so good. 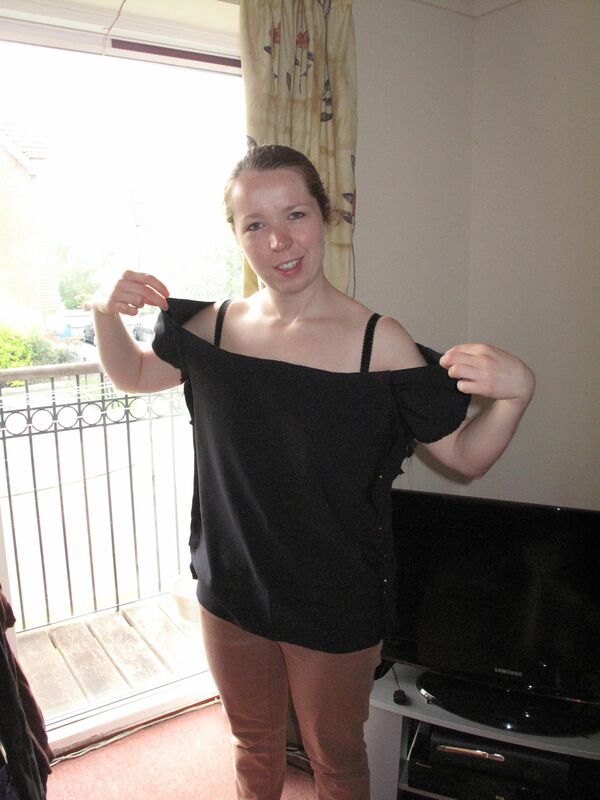 I then sewed the sleeves to the front and back, and pinned the side seams to get an idea of fit. Huge is not even the word. I couldn’t get it to actually sit on me at all because the neckline was so big it wouldn’t stay on my shoulders. I’m going to try and pin it to a reasonable size and then take the sleeves off and start again. Although on trying it on again to take this photo (apologies for the early morning photo, we also have no decent photo-taking locations in the flat…), it’s actually pretty tight around my hips, so I don’t think it will just be a case of cutting it down to a smaller size. Your blog is great! Now I have another procrastination stop on the net. Your dress looks stunning and I’m pretty sure you’ll be able to fix the top. Maybe once you put the elastic the neckline will sit on your shoulders. Don’t know, just guessing. BTW, I sooo want to go to Walthamstow Market now! I may be joining you next time if that’s ok, although I really cannot justify buying more fabric at the moment. Thanks for the info about the adjustable bias binding foot and see you next Tuesday in dressmaking class! Thanks for the lovely comment, I’m glad you like it! I’m so happy with the dress, although I have decided to re-do the zip – wasn’t quite level, and want to adjust the fit a bit. I can’t wait to see your trousers. Yes, definitely come to walthamstow next time, although I don’t think I need to buy any more for a while now either! See you on Tuesday! Yes, good idea. I hadn’t decided I wanted one last time I did a trawl of charity shops looking for patterns. Will have to go have a look. Although its kind of the weighing up of how much time you spend looking for a cheap one versus just paying for one! Will keep looking for a bit I think! It would come in so handy.